New York City is more than the bright lights of Broadway, the billboards of Times Square or the boutiques of SoHo. Travelers who want to make the most of their visit to the Big Apple should be sure to include a stop in Lower Manhattan, where plenty of culture, history and landmarks reign supreme. Whether it’s a couple of hours or an entire day, there’s something for every kind of visitor in this diverse destination. 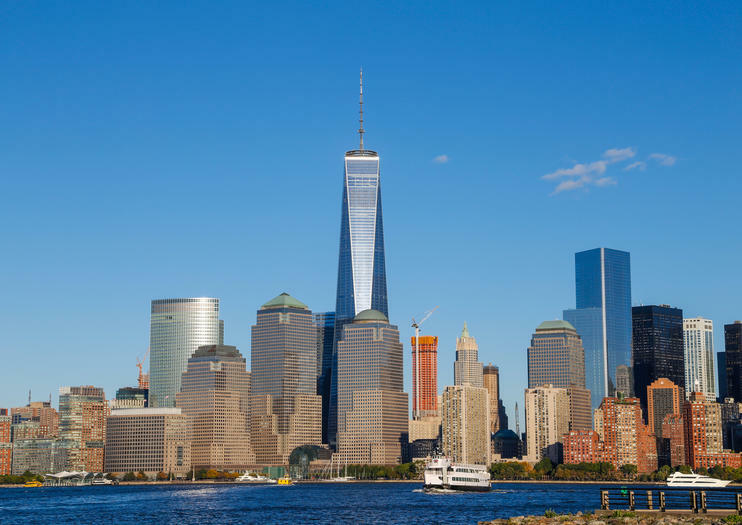 History lovers can check out the African Burial Ground Museum or the 9/11 Memorial, while outdoor enthusiasts can revel in the sunshine of Battery Park or the cruise along the waters on the Staten Island Ferry. Bargain shoppers will love the deep discounts of iconic Century21 and the unique stores located at the South Street Seaport. Lower Manhattan is also home to the world-famous financial district, which means a visit to Wall Street, the New York Stock Exchange and its massive bull are an absolute must! The easiest way to access all of Lower Manhattan is by using the newly renovated Fulton Street subway station. Travelers can access this transit hub using almost any subway line. Lower Manhattan is also accessible using the New Jersey PATH trains and those who are walking from Brooklyn will find Lower Manhattan at the foot of the Brooklyn Bridge. Experience the beauty of New York City at sundown on this 1-hour, narrated twilight cruise along the East River. Get incredible views of the Manhattan and New Jersey skylines, One World Trade Center, the Empire State Building and more, including the Statue of Liberty and Ellis Island. Learn about the history of the sites with live commentary from a tour guide aboard an iconic Circle Line Sightseeing boat! Enjoy the freedom to explore New York City at your own pace with this combo tour, valid for three consecutive days. Your pass includes a hop-on hop-off bus tour (featuring Downtown, Uptown and Brooklyn loops), a night bus tour, a hop-on hop-off cruise and a Liberty Island ferry, plus a ticket to either the Top of the Rock Observation Deck or the Empire State Building. Bonus: Museum of the City of New York admission is included! See New York City in a city slicker style with this 3-hour private tour in a chauffeured limousine around Lower Manhattan. As you lavishly cruise the streets of Lower Manhattan learn about the history of the city and of each place you pass by. See some legendary landmarks and neighborhoods such as Chinatown, the Lower East Side and One World Trade Center. Cross the iconic Brooklyn Bridge. Consider an upgrade to a 5-hour tour to include Upper and Mid-Manhattan, the perfect way to get to know New York in a day. See New York City from the waters of the Hudson River on your own private motorboat tour. Enjoy two hours of sightseeing with stops at the Brooklyn Bridge, Freedom Tower (One World Trade Center) and Statue of Liberty. Bring your group of up to six people along with your own food or drink for this exclusive New York boating experience. Your tour departs from a convenient location in lower Manhattan. Explore the borough of Manhattan on this 4-hour bike tour. Bike through Lower Manhattan, along the waterfront, up into the Upper West Side to explore Central Park, and through Midtown. Visit key districts and landmarks such as Little Italy, SoHo, Strawberry Fields, and much more, covering more than 20 miles of the city. Admire the views of the city and stop for a 30-minute lunch—not included—along the way. Taste your way through New York City’s eclectic neighborhoods on this mouthwatering pizza walking tour! Stop in at three unique and highly rated pizzerias to sample different slices, from Neapolitan to Sicilian. Along the way, learn about the fascinating history and culture of the neighborhoods you walk through. Customize your pizza tour with a choice of itineraries that cover Little Italy, Greenwich Village and the Lower East Side. Step into the shoes of a Roaring Twenties scofflaw on this cocktail tour of Manhattan’s best and most secretive speakeasies. Learn about the history of Prohibition and how New Yorkers responded with an underground liquor scene, and then visit six or seven modern incarnations of these vintage watering holes. Discover the locations and hidden entrances of such hard-to-find spots, and enjoy high-quality craft cocktails while soaking up the nostalgic atmosphere. Discover America’s financial hub on a small-group walking tour through Wall Street and the Financial District. Learn about the history of this business mecca and the stories of some of its famous, and infamous, businessmen. Visit a few filming locations from movies like The Dark Knight Rises and Ghostbusters and if you’d like, upgrade your ticket to include a self-guided audio tour of the Statue of Liberty and Ellis Island. Celebrate the Fourth of July on this 8-hour NYC sightseeing tour with a fireworks cruise. First go on a 2-hour tour of the city, and see famous historical landmarks. Then board a boat in New York Harbor, and watch the Macy's Fireworks Spectacular show. On your cruise, enjoy a buffer dinner, and see sights from the water, including the Brooklyn Bridge and the Statue of Liberty. New York’s vast size and confusing transit system can be overwhelming to navigate. On an active and eco-friendly cycling tour, cover the city’s major highlights without getting lost or stuck underground on the subway. Rides through popular areas including Southstreet Seaport, Chelsea Piers, the Upper West Side, and Central Park will give you a feel for New York City’s bustling atmosphere and leave you with a lay of the land. Learn the secrets of New York’s subway on a 2.5-hour underground tour with a private guide. Hear stories about the engineering, technology and people behind the subway’s construction. Discover legends and secrets about abandoned levels, hidden stations and fake houses that disguise escape routes around the city. See official and unofficial art as you follow the 1904 line from Bowling Green to Grand Central Terminal, and get a surprising look at places that every New Yorker sees—but few notice. See Downtown Manhattan from a rare perspective on a bus tour that includes state–of–the–art virtual reality technology. As you cruise past top landmarks, your goggles take you back in time to important historical moments, from George Washington’s inauguration to Black Tuesday. When you’re not immersed in the VR scenes, your guide provides little–known facts about points of interest on the itinerary, including the Brooklyn Bridge, Chinatown, and One World Trade. See the best of Lower Manhattan on this Brooklyn Bridge guided bike tour that covers all of the highlights. Navigate the city on two wheels and explore the streets as you make your way from Manhattan's southern tip to City Hall and the iconic Brooklyn Bridge. This easy climb leads to incredible views and prime photo ops, so be sure to bring your camera! Experience the history, landmarks and culture of Lower Manhattan on this Brooklyn Bridge guided walking tour. Follow your friendly local guide through the major highlights and check out the epic views from atop one of the world's most famous bridges. This tour is ideal for first-time visitors or anyone who wants to learn more (and see more) of this city's sites. Explore the architecture of New York City’s world-famous financial district on this fascinating 1.5-hour walking tour. Led by a knowledgeable local guide, discover some of the financial district’s most popular downtown buildings as well as some lesser-known and harder to find spots. See everything from Battery Park, the New York Stock Exchange and Wall Street to 28 Liberty Place, the Helmsley Building, Zucotti Park and much more. Also, witness the site of an architectural dig from the 1970s plus both the old and new Staten Island ferry terminals. Feasting and partying is the best way to celebrate the 4th of July. This all-day red, white and blue extravaganza in New York City is the way to do it. Start with a barbecue lunch on a terrace overlooking Times Square and Broadway. Then board a comfortable coach for a tour from Midtown to Lower Manhattan, learning about the history of New York City along the way. For the grand finale, board a boat to take a scenic cruise in New York Harbor, enjoy a buffet dinner and open bar, and watch a dazzling fireworks show. Make the most of your time in New York on a private tour of the city’s highlights. Your personal guide and separate chauffeur ensure easy access to locations on the day’s itinerary, which is customized to fit your needs and interests. You’ll see more of the city than you ever could by foot, cab, or public transit, and leave with an insider’s perspective on its most iconic neighborhoods. See some of the city's (and the world's) most bizarre and weird as part o this Ripley's Believe it or Not Times Square dining experience. Tour the halls of strange and uncanny artifacts in Ripley's 20 themed galleries. Then explore the sites of New York City while you dine at either Señor Frogs or Hard Rock Cafe in Times Square. Whether you're a first-time visitor or returning to New York, his two-for-one tour is sure to make a night of Big Apple memories. This walking tour allows you to see New York through Alexander Hamilton's eyes. Follow your guide, a professional historical reenactor in character as Hamilton himself, around Manhattan as he points out Trinity Church, City Hall, and other landmarks familiar to him from his time in colonial New York. Headsets provided to hear your guide clearly. Take a full day to see the areas of NYC you’ve always wanted to on this private, 6-hour walking tour. Together with your own personal guide, you and your group of up to nine can spend the day exploring the New York sights and neighborhoods that interest you the most. Your customized itinerary takes you to the places you request, and your guide's commentary is based on your interests.